Our cozy Lake House is located on a shady, tree covered lot with approximately 3900sq. ft., 4 bedrooms, 3.2 baths, and a 3 car garage (where boat can be delivered down the private boat ramp to the water). 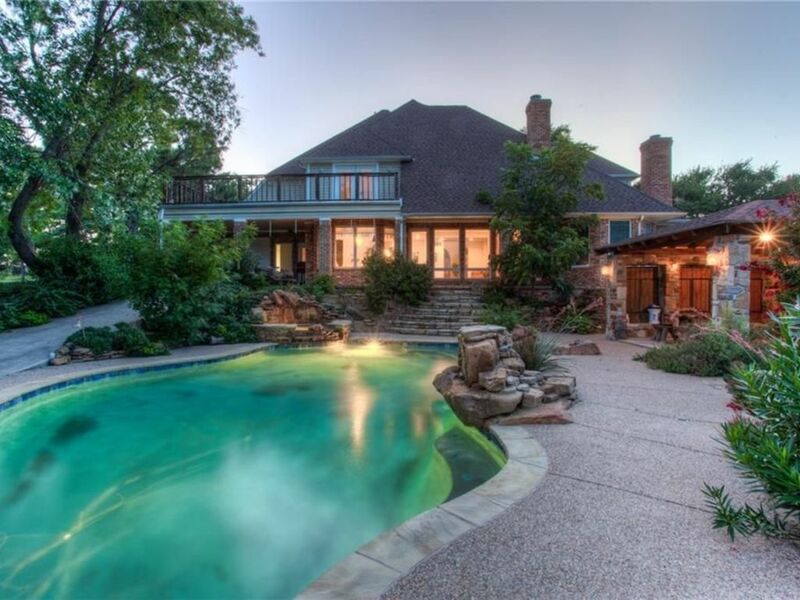 It features a beautiful pool with waterfalls & a gorgeous outdoor cabana with a fireplace. The white dock is one of a kind and features an upper shaded deck to take in the beauty of the lake and the amazing property. Our home has a rustic style with a cozy, lake house feel. There is also an upstairs game room with a large outdoor balcony and patio with a spectacular view of the green lawn and lake. Hi! We are a family who just purchased this house as a vacation home to enjoy the lake! We would love to share it with other families and groups of friends who would like to enjoy a little bit of lake life as well! We have 3 young kiddos who love this house and we feel like others will love it too. This is a beautiful home on a great lake! We just purchased this house to enjoy with our family and friends and hope that others can enjoy it too. We are in the process of filling the home with new furniture and plenty of beds so that groups of all sizes can enjoy a retreat. This house is located on a great part of the lake and has a gorgeous, white dock with the added benefit of an upper, covered deck to literally hang out on the water. The lawn to the lake is beautiful and the pool is an added bonus. The outdoor cabana is gorgeous as well and the perfect spot to sit outside with a nice fire and enjoy the view. The title says it all....staying in this home was like a small piece of heaven on earth! This truly is an amazing property and the pictures on the listing do not do this property any justice. I rented this property last week and brought my family in for a Christmas party. There were 10 of us staying in the home and the home is so spacious you would have never known it. The home has everything you need for your stay including plenty of cookware, dishes, utensils, etc. which was very handy because we pretty much cooked all of our meals there. The outdoor area was awesome as we kept a fire going in the outdoor fireplace while sitting out there visiting. We have rented a few homes on this lake in the past, but let me tell you that the views from inside and outside this home are absolutely stunning and just a step above the other homes we have stayed in. The sunrises are just breathtaking! The only thing as amazing as the home itself are the owners...David and Liz are simply amazing! They make themselves available for any questions or needs you may have and go out of their way to assist you any way possible. I normally rent anywhere from 2-4 VRBO properties a year and it is very rare when you get owners who go out of their way the way these folks do. If you are looking for an amazing property to rent in the area then look no further...this one truly is a step above the other properties in the area! As a matter of fact, I am already looking ahead to when I will rent this property again in the very near future. The Pecan Acres lake home was amazing with a great view and accommodations. The new mattresses decked out with great linens were very comfortable. The weather was not very nice but we were able to take some walks and build a couple fires outdoors in the evenings. Many games were played at the large round table looking out at the lake. Unfortunately the pool and the hot tub were in need of repair so we could not use them. The owners were very accommodating with quick responses to our questions. We plan to return. It worked well for our aging mother and her 7 adult children. Beautiful views with great outdoor space! The owners were great to work with and the views are just terrific! Plenty of space to accommodate a large group. Had great indoor and outdoor spaces including the pool & cabana. Would definitely recommend it! We had a wonderful time with friends and family. It rained the entire time, so, the open kitchen, eating, family room area was perfect for all of us to gather around. The large round eating area table was perfect for group games. The rain slowed enough for a basketball game with the net provided. The home is secluded enough that you get a real lake experience. The outside porch is covered and there's an area enclosed with a fireplace outside with couches. The view is breathing taking and one morning the clouds broke enough to catch the gorgeous sunrise. This house is definately one of a kind. It's a fun place you can really enjoy and you just have to see it to understand. Plenty of room for everybody and the kitchen is perfect for feeding a group. We hope to go back and hopefully next time can enjoy our stay with plenty of sunshine, but, if it happens to rain while we are there, we know we will enjoy our time together. Thank you Dave and Liz for sharing your home with us . The children loved playing in the secret passage. The parents enjoyed the Jacuzzi fireplace!! Beautiful, comfortable and fun on the inside and the backyard is extraordinary. While there are houses to either side, the home is well landscaped and positioned to feel that the lake is yours alone. It rained hard briefly, but no one went inside -the long garage opens to the covered porch and there is also a cabana so 50 people were easily accommodated. The pool is quite large, easily entertaining all the children. The open yard will accommodate any game or activity you can imagine. David and Liz are friendly and very accommodating. We would be delighted to stay with them again. Thank you! Definitely a 5 star home! Absolutely beautiful home! Perfect for our group of 8 adults. Honestly, I don't think you will find a nicer home with a pool and boat dock. Owners are extremely nice and respond quickly to any questions. If you want an extremely nice place to relax and unwind this is it! We hope to return next year. Rates are subject to change until reservation is confirmed. PLEASE NOTE: The hot tub, pool and outdoor fireplace utilize propane. The first 7 gallons of propane usage is included in the reservation fee. There will be a fee assessed of $3 per gallon for any usage beyond 7 gallons. The amount of propane utilized during your stay will be assessed after the reservation is completed. If necessary, the appropriate amount will be deducted from the damage deposit unless other arrangements have been made.